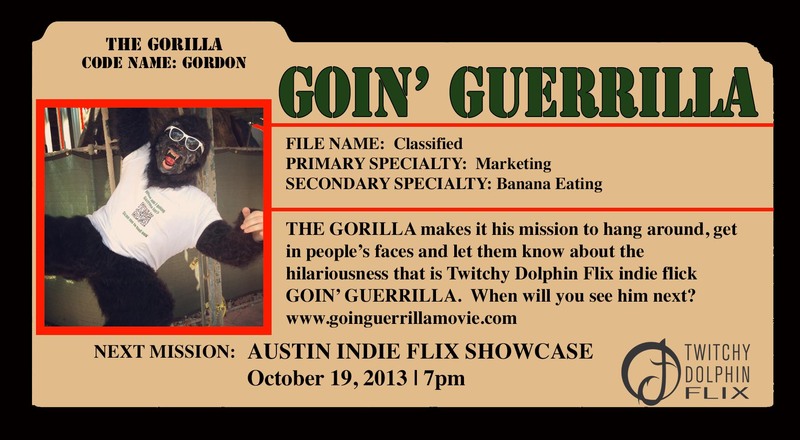 He’ll be at the Goin’ Guerrilla Texas premiere! Will you be there? This entry was posted in Uncategorized on October 7, 2013 by Twitchy Dolphin Flix. This entry was posted in Uncategorized on October 5, 2013 by Twitchy Dolphin Flix. Check it out folks! Twitchy Dolphin’s 15 year old minion has cut a trailer for Goin’ Guerrilla. It’s premiere is a little over a week away! This entry was posted in Uncategorized on August 14, 2013 by Twitchy Dolphin Flix. With the official word from Action on FIlm that the film will make its world premiere there, we wanted to put out a trailer focused on our wonderful cast! This entry was posted in Uncategorized on June 22, 2013 by Twitchy Dolphin Flix. Yes, that’s a question mark. This entry was posted in Uncategorized on May 21, 2013 by Twitchy Dolphin Flix. Thanks to the good folks and producing partners at Underdogs.com for coming up with this awesomely hilarious Red Band trailer for the film! This entry was posted in Uncategorized on May 20, 2013 by Twitchy Dolphin Flix. Special thanks to Twitchy friend and Pennsylvania filmmaker Adam Dunning for putting together this Goin’ Guerrilla teaser highlighting Mark McCarver and Luke Francis! Check it out! And make sure to like the page for his film laughter. This entry was posted in Uncategorized on May 13, 2013 by Twitchy Dolphin Flix.